So you know when you have a problem area in your home and the work it would take to actually come up with a plan and carry out said plan seems almost impossible but you know you have to follow through or you might actually drown in junk mail and craft supplies? Yeah. That’s where I was when I showed you those awful before photos of my office. But I knew that if I publicly embarrassed myself it would hold me accountable and I’m happy to say that following my method to declutter this space has finally gotten me to the point of being able to decorate it in a way that inspires me an the biggest. hugest. change has officially occurred in my office and things are lookin’ up! We turned the standard closet in this room into a beautiful built in cabinet and display space for all of my supplies and it is life changing! You’ve got to see this transformation! We started with this standard 70 inch wide closet. 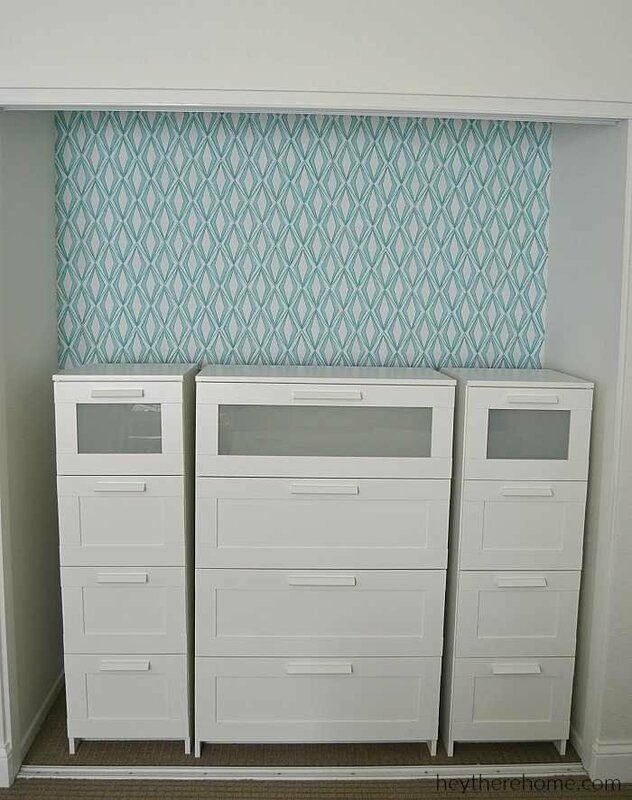 Like I hinted on Instagram the other day I was adding a big dose of pattern (I know, so unlike me) with this beautiful wallpaper from the talented Ms. Kate Riley’s collection on Spoonflower. The instructions warned me that I needed a buddy to assist me in hanging it, but the only person around was my 3 year old, and well, he would have probably had other plans for this pretty paper that mommy wouldn’t have agreed with, so I did it myself. I started by drawing lines that were perfectly plumb to use as a guide. 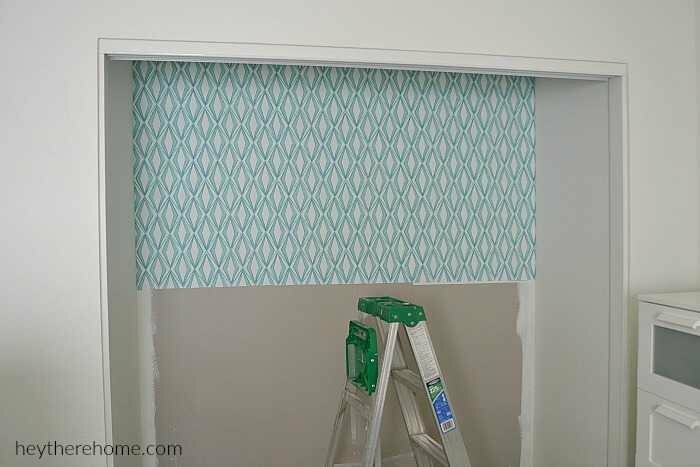 I wanted the pattern to be straight and couldn’t rely on the ceiling line for this. I hung it in 3 pieces part way down because I planned to install my built ins on the bottom half and this way I only had to buy one roll. By the way, I sprung for the repositionable kind, and I’m so glad I did because it caused a lot less anxiety when I needed to make a few minor adjustments along the way. I had a little overlap on the side corners which were easily taken off with a sharp utility knife. My mom was nice enough to come over and participate in a Ikea furniture-building-a-thon with me one day and we put together these 3 Ikea Brimnes dressers. 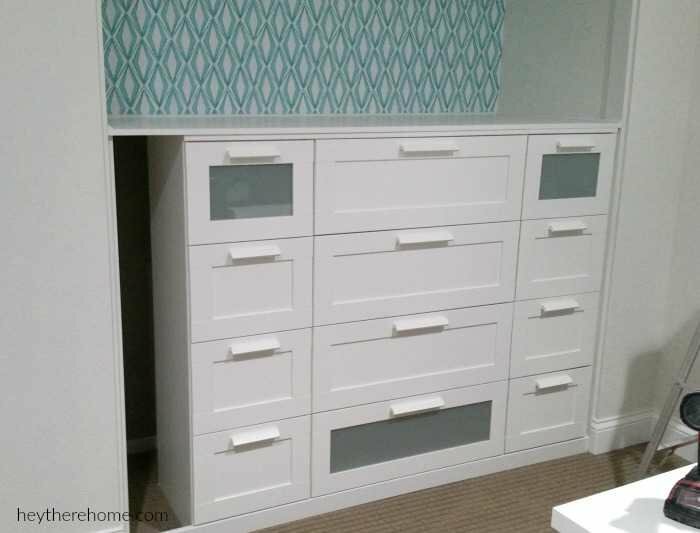 I really like that the top has a frosted glass front to add a bit of something to the space and I also liked using the 2 different sizes to make it feel a bit more custom and less like I threw a few dressers into a closet. The problem (which you’ll see in a minute became an amazing bonus) was that I had 8 inches left over so I could have centered the dressers and used wood to cover the space, or even better I could push them to one side and use that 8 inches. Which is exactly what I did. 8 inches of space is a lot to give up when you have a lot of crap to store! Right? The dressers were pulled forward to cover the hole in the carpet that once was the closet door track and framed it all in with inexpensive wood painted white. The top got one continuous piece of thin white laminate so that there were no seams. I love this spot because these are the types of things I never knew where to put and they were always getting in my way! Ok. Let’s just take a minute and step back to admire that amazing wallpaper and all of this handy work! The hubs helped me install shelves on the top half for even more storage. I was really careful not to add too many because I wanted the wallpaper to be the star of the show in here but I’m definitely excited about playing around with the styling of these shelves and switching it up as I get even more settled in here. This room is off to an amazing start. I still need to get things organized and the finishing touches complete so definitely stay tuned! It might have to happen in 10 minute bits of time since my little one is giving up his nap on most days but this momma is determined to make this space happen because the fact that I can now find a pair of scissors in 5 seconds flat is a definite productivity changer! Share the love, pin the image below! Thanks for stopping by today to see me on my way to redeeming myself! Can’t wait to show you the end result! DIY Dry Erase Board Weekly Planner from a $10 Thrift Store Find! You’re so welcome Pauliina! Happy house hunting! I’m so bummed that I am not going to be able to do this. My closet is framed so the frame will prevent me from opening the drawers that are up against the right side wall. I might still do something similar, but with only two sets of drawers. Hi Melissa, I definitely think you could trim down the number of drawers to match your closet configuration. Best wishes! This looks so nice, neat and streamlined. I am, for sure going to keep this in mind for my oil organization. Thanks Kelly, good luck on that project! wow this is great! I am converting my guest room closet into a crafting area. I’d love to see inside the drawers for the internal organization! Corey, love the idea you had on converting your closet space with the ikea units, but have a couple of follow up questions. 1. 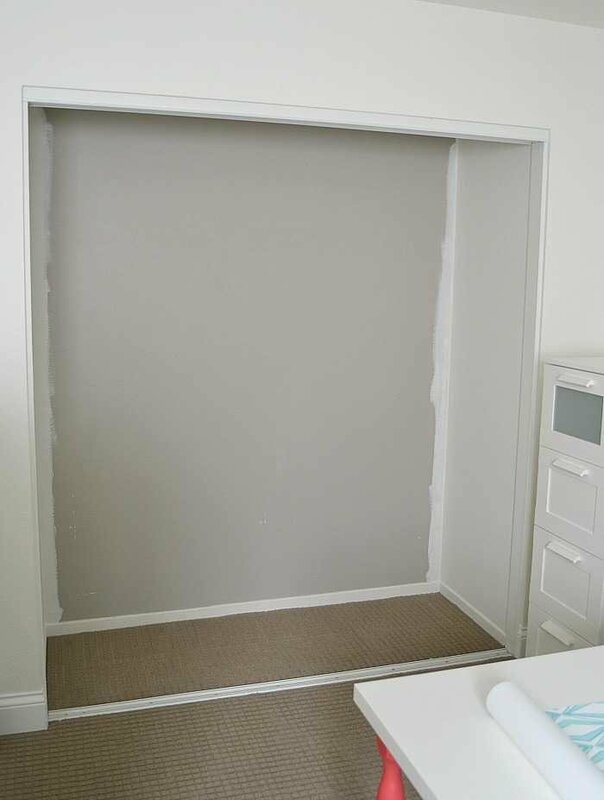 When you moved the units forward in order to cover tracks from closet doors with the piece of wood, what did you do to keep them from eventually moving back? 2. What did you do to keep units tightly together so there were no gaps in between the three units? We screwed the units together and then the top holds them in place and covers the gap between the back of the dressers and the wall since the top is attached to the tops of the dressers from underneath. Does that answer you question? 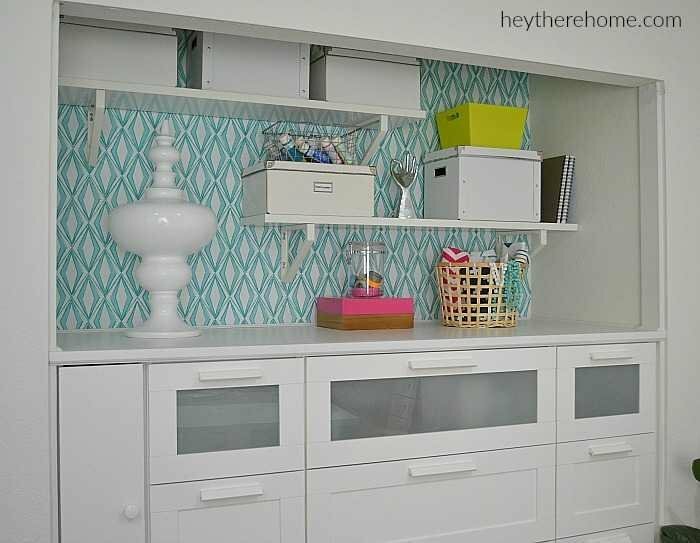 What door or paint did you use to match the ikea dressers? I didn’t match it on purpose. The door that I created is just a piece of laminate coated MDF board from the hardware store and the paint on the walls is Alabaster by Sherwin Williams. They don’t match perfectly, but it all is pretty darn close. The door matches almost perfectly though. Oh no Jenny! I didn’t get them too long ago either. I’m sure they’ll be coming out with something similar soon. Thank you for the wonderful inspiration! I have been planning my craft/sewing/office room for some time now and really like the contemporary look of these drawers & cupboards. They only have the larger size of drawers, 30 3/4 x 48 7/8 but not the smaller drawer, which I was needing to complete my look. Do you have any insight as to when/if they will have the smaller drawer available? My research is coming up empty. Hi Paula, perhaps you can contact IKEA customer service and ask them. I’m not an IKEA affiliate so don’t have any information other than what’s on their website. Good luck! Normally I don’t post my thoughts on any of the ideas you have shared. Today is the exception!! I really like the creativity and impromptu solution you came up with!! Great job!! Absolutely beautiful, I just wish I had a closet that I could use!! What a beautiful & creative space with my favourite colour on the wallpaper! Thanks for sharing it. That color is definitely my fave too! Just makes me happy! Thanks for stopping by. Hey Karen! How flattering! The laminate is from Home Depot and the bottom piece is MDF in white. Hope that helps! this is really snazzy! And so functional, too! It gives me hope for my closets yet! That little compartment on the side is amazing! I need one! It was a last minute solution and turned out to be my favorite thing ever! Just a few weeks till we get to play in Salt Lake!!! So pretty Corey! Whatva great storage solution! 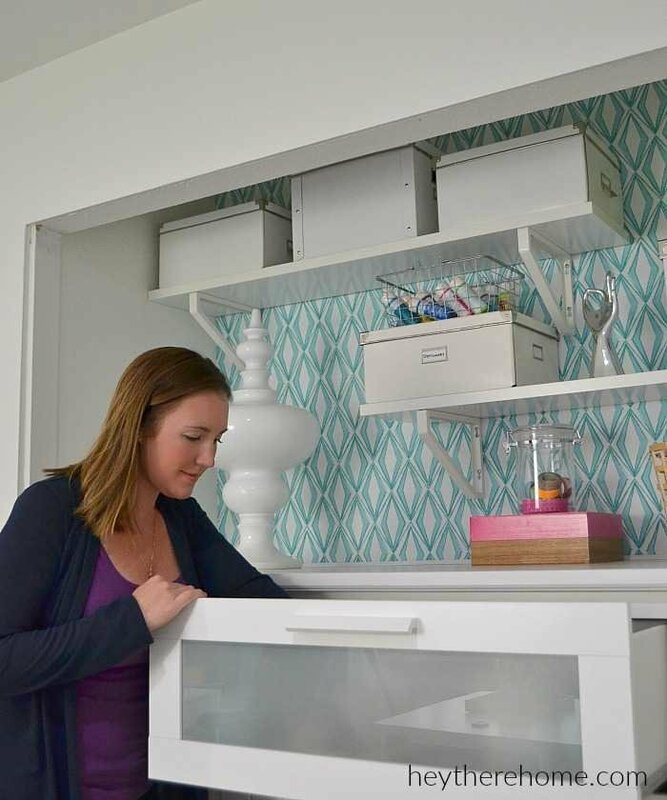 Great project…a much better use of available storage space. I’m having a V-8 moment. (lol) Well done! Wow, this is just great! Seriously, perfect use of space. Pinning/sharing like crazy. Love it. WOW! Corey, what a great space. 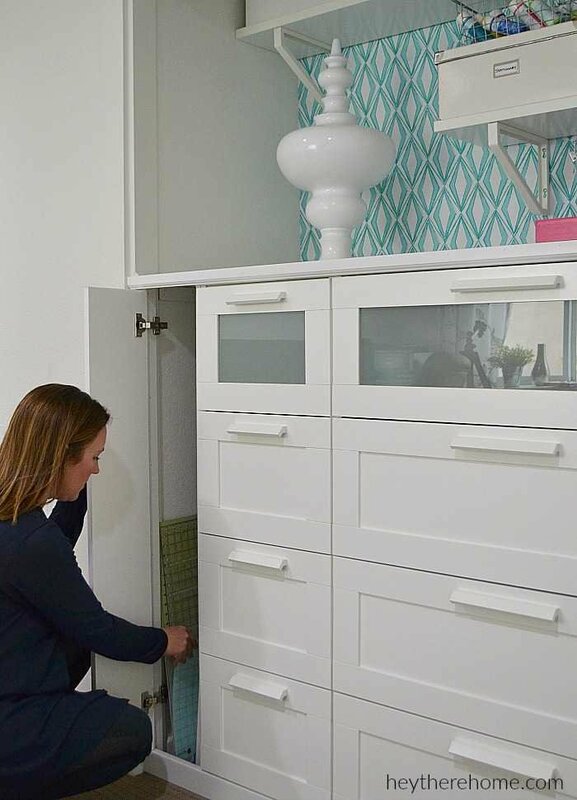 I’m pinning both this closet transformation AND those Ikea shelves! Love that you added a mini door to that extra 8″ too. Thanks girl! This space is so much more inspiring and it is making me get so much more done already! 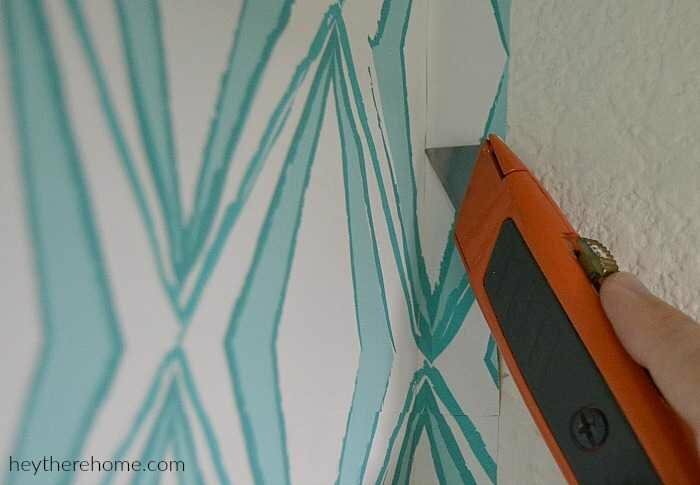 Wallpaper makes it! Nice job. Steal away my friend! Miss you like crazy. I’ve been hiding and head down workin’ but want to catch up soon! Beautiful! 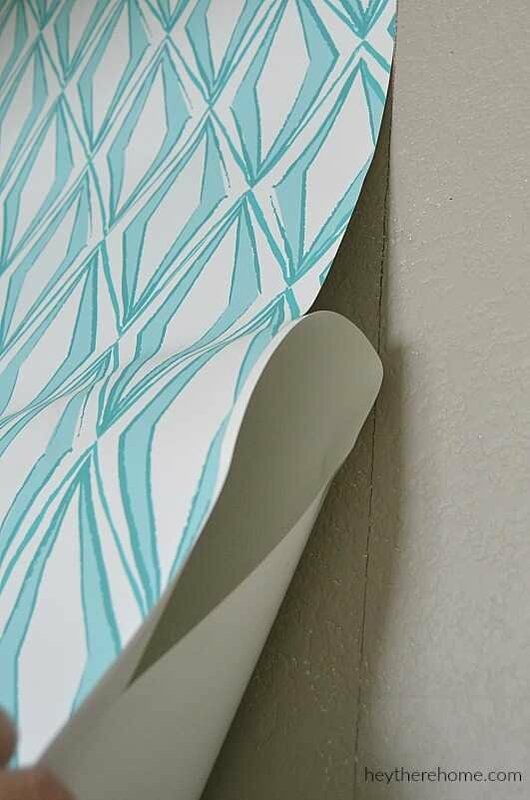 I’m glad to hear you liked the wallpaper from Spoonflower. I’m deciding on a pattern for my laundry room and am choosing from a few available on the site. Hi Cindy. It was so easy to put up and looks amazing. 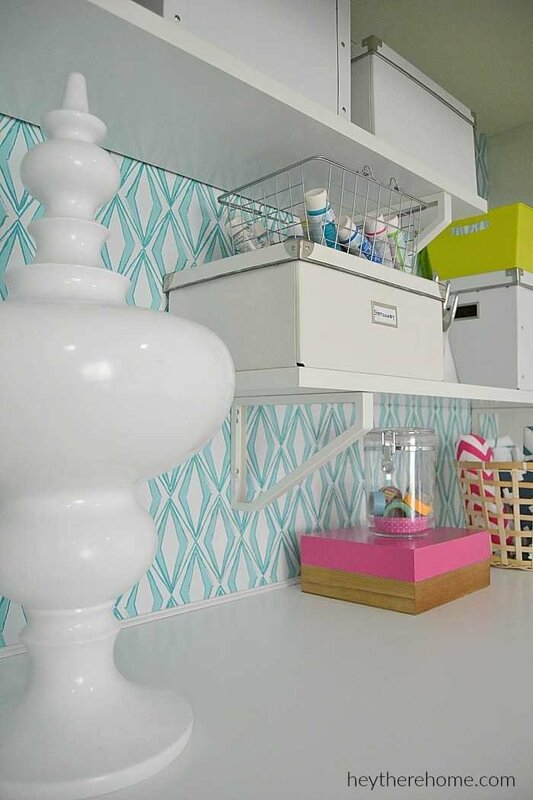 Can’t wait to hear how your laundry room turns out! Love it! It all came together seemlessly. Thanks for showing us there are ways to overcome the non-seemless times. You are so very welcome Paula. Coming up with ways to work around those kinds of problems keeps me up at night at times but it is so much fun! I seriously love what I do and love to share the inspiration. Hope you are having a fantastic day! That is amazing! And I love the door on the side. The wallpaper is definitely a hit! Great job and thanks for sharing! Thank you so much Melanie! I’m pretty convinced that wallpaper is my new best friend and my husband is a bit scared. Hahaha. You did a fabulous job! 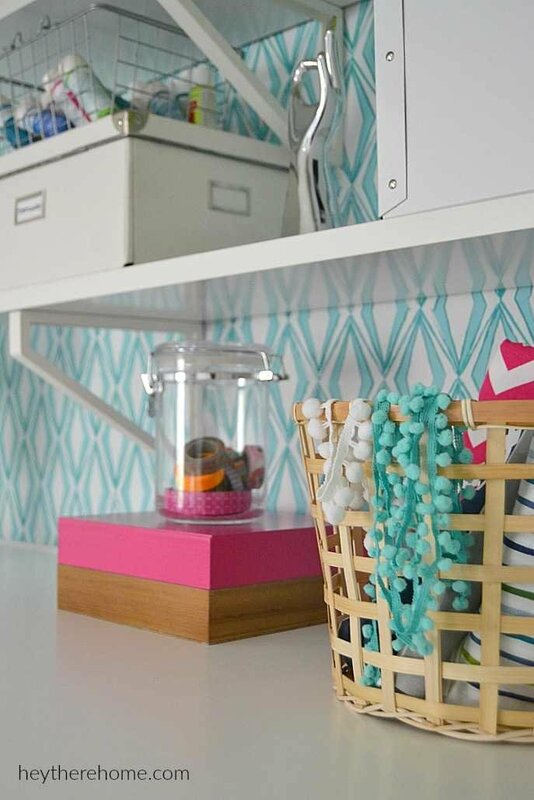 I love the wallpaper and you are right that a small amount looks great. 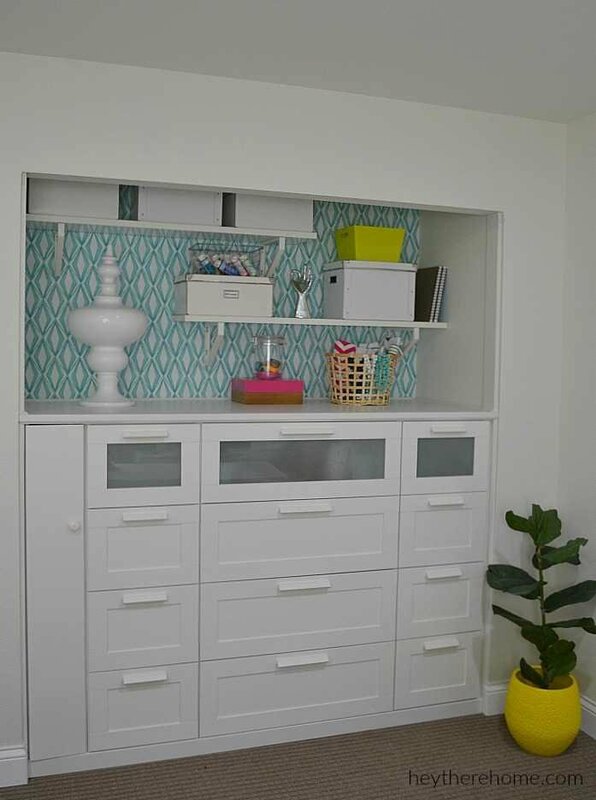 The closet storage unit is much better than a plain closet any day. You should be proud! Thank you so much Vivian (and I have to admit I am proud) Not only of the way it looks but that I finally have a system to keep all of my stuff organized! Wow! It looks awesome and I am totally jealous of all that glorious storage! Thanks Lizzie. I think I’m finally set up to stay organized! It feels so good, and I now realize that I put it off way too long. Hope you are having a great day!